Ghazni – April 12, 2018: Hazara district governor of Khwaja Omri among 7 killed by Taliban terrorists. The attack also left wounded 12 NDS personnel. Dawn news reports, Taliban planted mines to prevent government reinforcements from coming to help and quickly took responsibility for the attack. 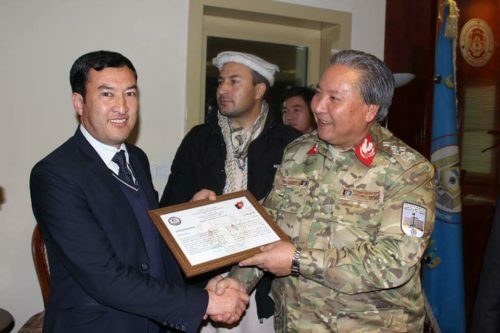 Hazara MP, Arif Rahmani, said the district governor, intelligence service director and a deputy police official were among those killed in Thursday’s attack. Afghanistan's policy for known history has been to dehumanize and exterminate Hazaras. Taliban thugs are continuation of what ARG has been doing for over a century. "چرا که شغل ما "مُردن" است!" لیاقت احمدی یکی از شهیدان دیشب در #خواجه_عمری است که همرای چند تن دیگر جام شهادت را نوشیدند و مارا در سوگ نشاندند. روح شهدا شاد و یادشان گرامی باد!